Are you ready for some serious carb loading? 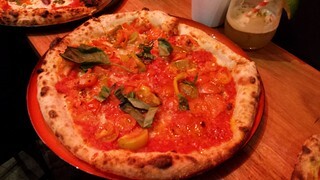 For dinner on Friday night we went to the fairly new Red Sparrow, an all vegan pizza place. Normally I am on the ball and book for things, but my mind wasn't in it and I wasn't sure how many there would be or what time it would be. Turns out they were fully booked out, but were able to squeeze us in on some bar seating. Book ahead folks! Or get takeaway/delivery, lots of boxes were heading out the door. Leigh and I shared three pizzas. 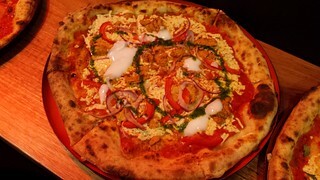 Two from the specials (the Tandoori Chicken and the Hawaiian), and the Puttanesca. They were good pizza. Not as good as Gigi's in Sydney, but Gigi's is a different beast all together. 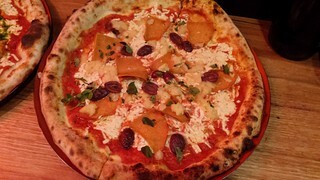 But close to Pizza Pi or Sizzle Pie in the US (Pizza Pi still wins my heart for best trashy pizza). The tandoori chicken was not very spicy, which was good, though did have a coconut drizzle, eh. It was probably my least favourite (I picked off all the capsicum). I enjoyed the Hawaiian (which we got with olives because that is the best way to have a Hawaiian), though I wish the toppings were a little bit more evenly distributed. 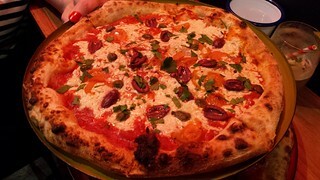 The puttanesca was very nice (we got the chili on the side), though the flavour of the sauce was a bit drowned out by the epic ton of vegan cheese that was on it. That may have been a case where less was more. Leigh's friend Neibi had recently overdone herself with mock meaty cheezy pizzas, so was after something a bit simpler. She got a tomato pizza, hold the vegan cheese. 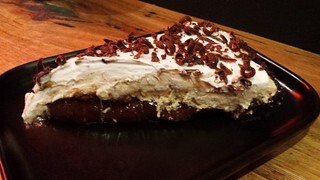 To finish we shared a piece of Peanut Butter Banana Chocolate Pie. The top layer was based on coconut, though it was pretty mild and not too fatty. I was happy to leave it the the others and scoop out the delicious peanut butter banana chocolate underneath. SO GOOD! Very rich. The next morning, after the carb-tastic feast of Friday night, we had some green smoothies. HA! No, we didn't. Instead we went four a double dip to Smith & Deli. First stop by was for breakfast and croissants! 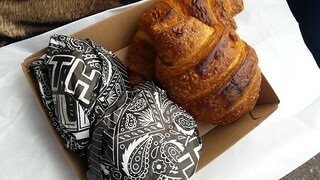 Here's what some Egg McMartinez sandwiches and some pizza croissants look like. My Pizza Croissant is actually snug in my freezer here in Brisbane, awaiting a chance for me to drown it in ketchup as I forgot they are a bit spicy! 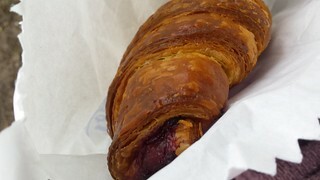 But never fear, because I also had a Blackberry and Chocolate croissant to feast on, as well as the best chai latte ever. After this we swung by the new location of the Melbourne Cruelty Free Shop, which is the biggest vegan supermarket in the world. Big in area, though, as the selection itself was fairly standard. Still, it was fun and I picked up a few goodies. 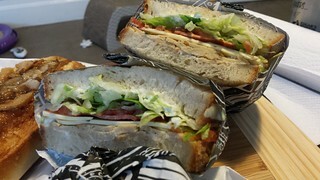 Then it was back to Smith & Deli at 11.30, which is when they start serving sandwiches. Also to pick up some goodies from their grocery shelves (they have a lot of fun products). And a peanut butter hot chocolate (I have to remember in the future to just get a small, as they are so rich!). So back to the sandwiches. I was thinking maybe three to share, Leigh had other plans. We ended up getting a lot. We took them back to Leigh's for a lounge room picnic. Let's break it down. First up, The Mensch! 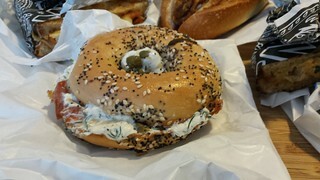 Smoked salmon, dill cream cheese, red onion & capers on a bagel. We got it without the raw onion, though. The smoked salmon seems to be made from tomatoes and was very nice! Their bagels are super filling and heavy though, so go with caution because they will fill you up fast. The Hail Seitan is one I'd wanted to try for a while, though I knew it would sit pretty heavy so I was glad to share. 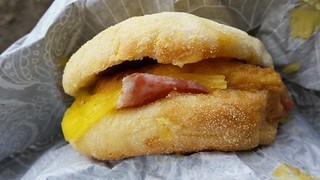 It has salami, ham, turkey, pineapple, BBQ sauce & cheddar. All things I love! It was good! The Free Willy 2 is not one I would have picked, given that I am not a fan of most faux fishy things (vegetable-based salmon substitutes excepted). 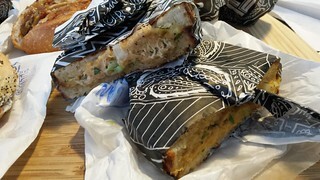 It is a toasted sandwich with their tuna salad and melted cheese. No idea what they use for their tuna salad, and never need to know. I took a tiny bite of this and I was out. Not for me. Though I have it on good authority from Jojo that if you are looking for a good tuna sandwich, this is one! So it is all personal tastes. 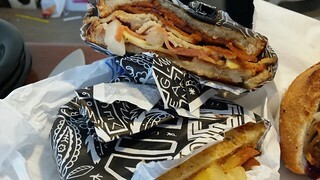 The Home Alone is the first sandwich I ever had from Smith & Deli, but Leigh was yet to try it. 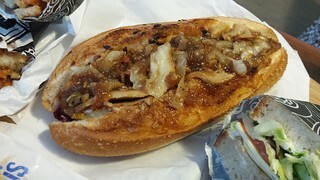 It has turkey, stuffing, roasted Brussels sprouts, cranberry sauce, mashed potato and gravy on a roll, and it is still one of my favourites from there. Finally, I wanted to try the Club Sandwiches Not Seals, which had turkey, bacon, lettuce, tomato, mayo and cheddar on sourdough. I do love club sandwiches, but I had been wary of trying this because once you have The Club at Wayward Vegan Cafe in Seattle, no other club measures up. And I'm sad to say this fell way short. I didn't mind that it didn't have the middle layer of bread (especially as there was enough bread to go around on this particular day), but it was kind of just like a meat and salad sandwich. The cheese was a bit rubbery. It was cold. If it had been toasted it would have been much improved. But... eh. My friend Taylor loves them, though. But he has never had a Wayward Club. Obviously you cannot go to Smith & Deli and not come away with some sweets! 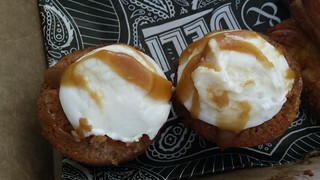 We got some Ginger Apple Cakes with Cream Cheese Frosting, which were super nice and actually not too sweet at all. 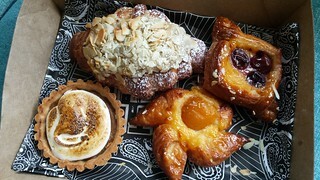 I also got an almond croissant (which I brought home for my mum), a cherry danish, and apricot danish, and a sweet potato tart with marshmallow frosting. Leigh was horrified by the thought of the latter, but I really enjoyed it! We watched the first episodes of the new Twin Peaks that afternoon. 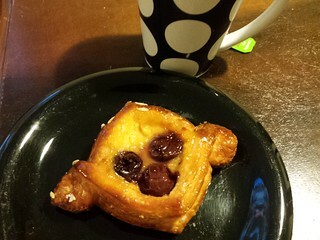 Unfortunately Smith & Deli did not have any cherry pie, so I made do with my cherry danish (which kind of looked like a little owl, so on theme) with a damn fine cup of peppermint tea. This isn't even the end of the food we ate that Saturday, but it is the end of this post! 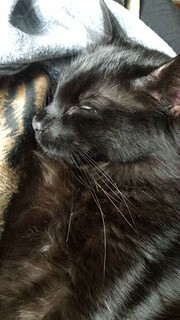 Chia having a sweet little nap. Let's get into some Melbourne adventures from my recent trip there! I call this Melbourne The First 2017 as I am probably going back to Melbourne another three times this year... the next one in only two weeks for OzComicCon! But for this trip, I went down to visit my friend Leigh and meet her kitty Chia! I'd like to apologise for some of the photos in this post and those to follow, the camera on my phone has been having a shocking time with focus. However I am now in possession of a shiny new Samsung S8 (upgraded from my S4), so on future trips my photos should be amazing! I had a lunch time flight on Virgin, which does not offer vegan food on the flight. So I picked up some things from the airport. 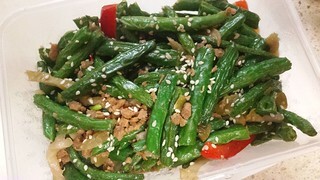 Sadly Sumo Salad did not have my favourite salads, the only vegan ones they had were full of capsicum. 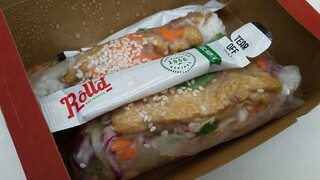 But I picked up a couple of rice paper rolls (regular tofu and low-carb tofu) from Roll'd, complete with some Veg Nuoc Cham. The regular carb-full one was my favourite, because the low-carb one had raw onion in it. 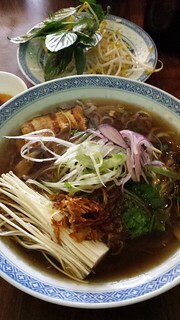 I had hoped to try their vegan pho, but that wouldn't be good to transport onto a plane and I didn't have time before I flew. 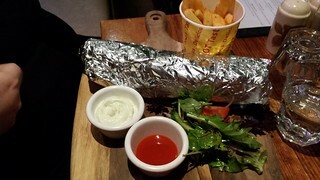 I also went to Mad Mex and got a veggie burrito, hold the cheese and sour cream. No photo of that because I ate it on the plane and it was super not photogenic. I landed in Melbourne hopped on the SkyBus and then took a cab to Leigh's work. While I was waiting for her to finish, I headed to Mantra Lounge for some afternoon snacks. I have walked by this place so many times, but never been in. They are all vegan and have a range of curries and lasagne and salads and burgers at cheap prices, and they also have half serves if you just want something small. I was after something big... giant in fact. Their GIANT cinnamon chocolate chip cookie. This was so good that I had a nibble and immediately went back and bought another one! 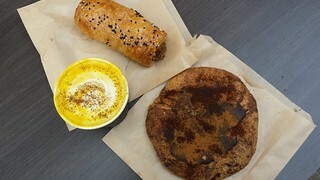 I also got a golden latte, and a sausage roll for Leigh. It was a Thursday, so we met up with our friends Neibi, Michelle and Elyce at The Cornish Arms for trivia and brown food. The Cornish excels in brown food. 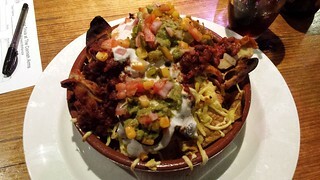 Michelle got the Vegan Nachos, which were GIANT! And had a little bit of colour in them. 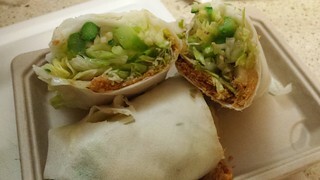 Leigh had her favourite Vegan Souvlaki Wrap, and Neibi got the super fried Vegan Hot and Spicy Box. 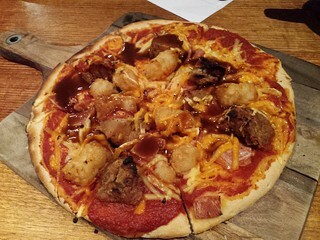 Elyce and I both got the Vegan Colonnello Pizza, which had popcorn chicken, potato gems, bacon, two types and cheese and gravy. It was pretty good, I just wish The Cornish could get their toppings more evenly spread! Also more gravy please!!! The next morning Leigh had to go back to work. I was in the mood for something a bit lighter, so I headed out to The Glass Den. 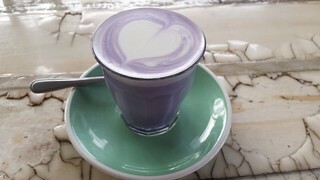 I started with a super yummy Taro Soy Latte - pretty and purple! 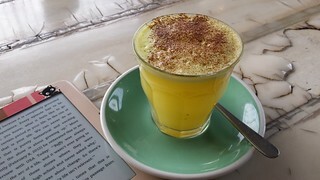 And I also had a hot Apple Cinnamon Ginger drink, which was yum. For my breakfast, I got the vegan version Avocado and Peach Bruschetta, which was a super fancy avocado toast, with added almond feta (the menu said macadamia, but it was a new menu and they still only had the old almond one... also they charge $7 for what amounted to a tiny little sprinkle). 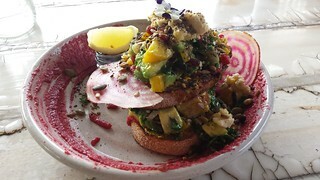 As well as avocado, toast, and peach, it also had beetroot hummus, dukkah, candied beetroot, salsa and balsamic reduction. It was so yummy! The only downside was the salsa, which had capsicum in it and was quite small so it was hard to pick out. I may never own a house, but at least I had a nice breakfast! For lunch I went to Good Days, which is right next to The Cornish Arms. This Vietnamese place has a small menu, with a couple of vegan options. 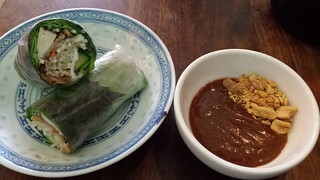 I had the yummy Vegan Rice Paper Roll, which was served with a peanut and hoisin sauce. Also the Vegan Mushroom Pho, which was delicious and had so many mushrooms!!! 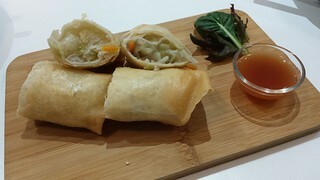 They also have vegan spring rolls and a vegan spring roll salad, but given it was chilly I was all about the soup. Shout out to Veganopoulous who gave me many suggestions for places to eat, and helped me form my Friday breakfast and lunch plans! I was in a walking mood. I had walked about half an hour from Leigh's place to get to Good Days, and I ended up walking a fair bit more down to Princes Park. 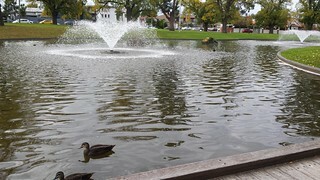 I saw some ducks in a pretty fountain. I caught the tram into the city and wandered around a little. 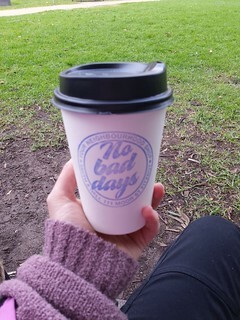 I needed an afternoon pick me up, but finding somewhere that does non-raw afternoon tea-style things in the city is hard! However, as I was wandering through The Emporium I noticed a little gelato stall, and they had vegan gelato! it was called 7 Apples Gelato. 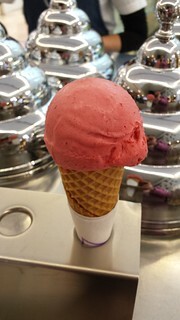 The vegan flavours were raspberry and lemon, so of course I had raspberry. In a cone, as their cones were vegan as well! It was so good. Perfect and creamy and fruity. An excellent afternoon revival! CHIA! 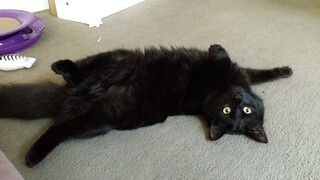 What an adorably, silly, gorgeous, handsome little floofball. So glad I got to meet him! 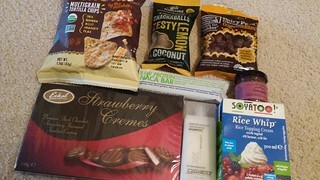 This is the final month of my six month gift subscription to the Cruelty Free Shop Vegan Mystery Box, so my last box of the year. Although I am kind of tempted to do the next six months for myself, because it has been a lot of fun getting a present in the mail every month! Let's see what we got this time! Fabulous Freefrom Factory Crunchee Bites: These are tiny little honeycomb bites covered in chocolate. Honeycomb isn't my preference, but the package got a bit busted in transit so I started eating these straight up. They are a bit inconsistent in texture - some are soft and some are crunchy. But they are way too sweet for me. My dad enjoyed them! Late July Tortilla Chips - Sea Salt by the Seashore: I haven't had these before but corn chips are always a classic. Will probably use them to make a bowl or or nachos. Soyatoo Rice Topping Cream: These are handy to use as an ice cream base, in place of soy creamer in recipes, or as a pouring cream. I have never been bothered to whip it, but one day I shall! Eskal Chocolate Cremes: I am very very happy that I got strawberry (some people got orange). Giovanni Smooth as Silk Shampoo: I am pretty committed to De Lorenzo, but will be curious to try this. Is a handy travel size. Tom & Luke Zesty Lemon and Coconut Snackaballs: I've busted into these and they are indeed zesty and quite satisfying, I only need one or two to make me happy. Health Good Guys Maca Raw Protein Bar: I haven't even heard of this bar before, but I cannot say no to a good bar. Here's hoping it is good! 99th Monkey Cacao Hazelnut Butter: I am pretty excited about this. I am waiting for just the right time and mood to make the most of this adorable little bottle. Overall I was pretty happy with the box! There was also a recipe vegan brownies topped with rice cream and caramel, using the rice whip. My baby girl has had a bit of a rough couple of days. On Tuesday evening she started straining to pee and had blood in it. I brought her some pain relief home from work to give her some relief until we could get a urine sample. But turns out she is very sensitive to opioids and ended up spending all night sitting in front of her water bowl with huge eyes, meaning I was up all night in a panic that something worse was wrong. Thankfully it is 'only' a UTI, which was expected given her signs and her kidney disease. 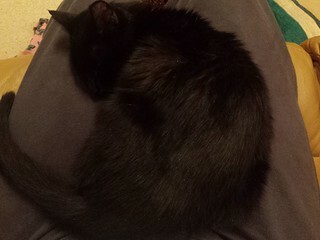 She had bloods taken and her kidney disease is stable, so that is good. And she is now on antibiotics and is feeling much better about life, she seems to be back to normal today! Four weeks of antibiotics (she is having a weekly injection), and then a recheck in 6 weeks. I hope that will be the end of it! 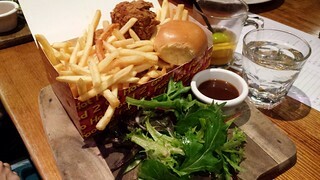 I got back from my Melbourne trip a couple of days ago, which was great and involved far too much delicious food. 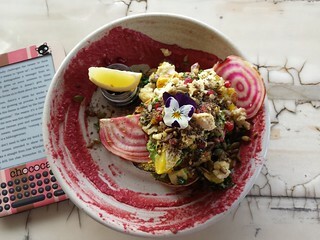 I still need to organise all my photos and write posts, so in the mean time enjoy this post about eating out (or, more often, in) at Superoll, a local vegan-friendly vegetarian restaurant that is very close to my house! The first time we got takeaway. This was shortly after they first opened, and since then they have changed their menu a bit, and given everything on the menu cute names. 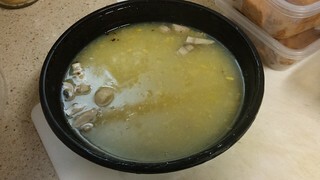 The corn soup is huge for only $5, and very satisfying. I have had this soup a number of times when I have been down in spirits or health. Once home, I normally mix in a bit of nooch for a cheesy corn soup. 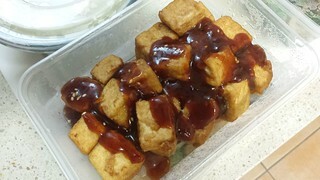 Deep Fried Tofu with Special Sauce. This is no longer on the snack section of the menu, instead it has been moved to the mains section under the name The Fifth Element (it is a five spice sauce). My dad ordered the Green Beans and Chicken Strips, which was a bit bland. A similar version is now on the menu with the name Mr Bean. 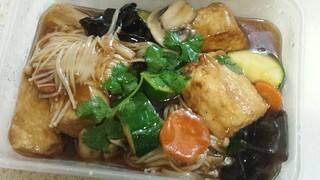 And my first order was the Deep Fried Tofu and Vegetables with Mushroom Extract Sauce (now called Master Tofu). I really love this one. One time, we actually went to the restaurant to eat! 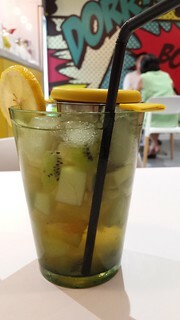 And I ordered a yummy Fruit Master iced tea with lots of fresh fruit in it. We split a couple of starters. First up, the Forever Original Super Roll, which is basically a large, pleasant spring roll filled with shredded cabbage, carrot and mushrooms. We also got the Char Siu, which is exceptionally delicious! 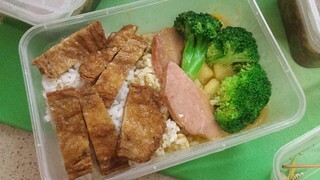 You can also get this as a meal with rice and vegetables if you want. I ordered the Happy Farm, which just beats out the Master Tofu as my favourite. It has yuba, broccoli, cabbage, carrot and different types of mushrooms in a yummy savoury sauce. Also some skanky capsicum, which was immediately picked out. 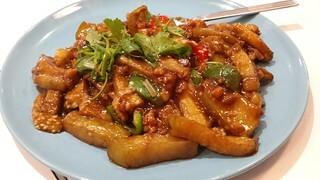 Mum ordered the Purple Soldier, which is eggplant braised in soy sauce. (They also have a spicy version of this called the Black Swan). We have since had takeaway a bunch of times. I normally get the Happy Farm, or sometimes Master Tofu, though my dad often tries something different. We did try the Asparagus Fresh Superoll once, which was fine but a bit bland. 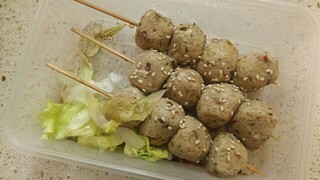 And the Yojiimball, which are described as crispy konjac balls with sweet soy sauce, but are actually kind of chewy seafood balls. So not a fan. 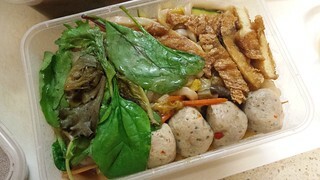 Dad got the Legendary Udon, which is topped with deep fried beancurd and more konjac balls. 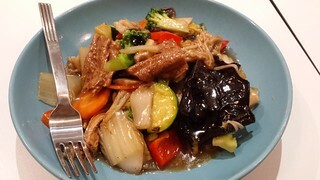 There are noodles and veggies underneath in a soy sauce. He also tried the Papas Curry, which is a fairly hot potato curry topped with things. 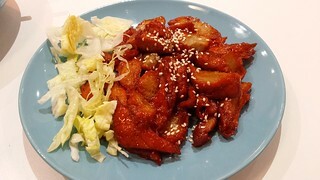 It is too spicy for me, but he likes it. 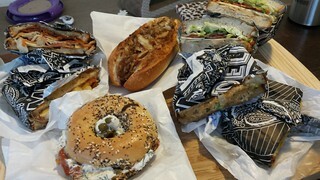 Given that Superoll is only five minutes away from my house, and provides tasty vegan food, you can imagine that we will be repeat customers! 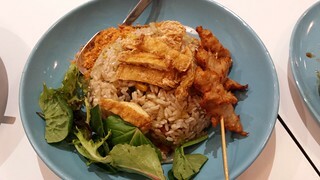 One day I might even go and eat in the restaurant again... or I can just order takeaway. If only I could get delivery, I would never be stopped! 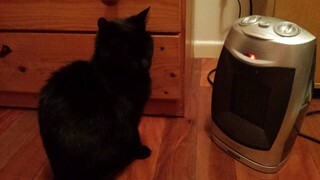 Winter is here... Dim Sim has no issues with hogging the heater to herself!